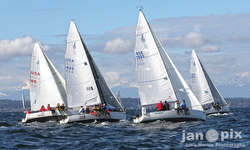 (Seattle, WA)- The second race of the Center Sound Series is now on the books, a three-race series hosted by Corinthian YC of Seattle. The start on Saturday was at 10:00 AM and the fleet had to contend with light airs and lots of current for the 26.0nm course. From the start, round Scatchet Head Lighted Gong Buoy (LL#16555) to port, and finish by leaving the start mark buoy to port. J/Crews faired well in the challenging race and augmented their series scores to remain in contention for the overall series in a number of classes. 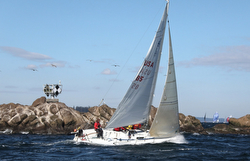 PHRF 2 Class is comprised of five J/80s and a J/30 in the 11-boat class. Currently leading in the top two spots are Phil Dean’s J/80 RUSH with a 1-1 for 2 pts and in second is John Sezer’s J/80 RECKLESS with a 3-2 for 5 pts. Rounding out the top six are David Schutte’s J/80 TAJ MAHAL in 4th with a 2-8, Richard Demmler’s J/80 TASTES LIKE CHICKEN in 5th with a 7-3, and Derek Storms & Cindy Gosset’s J/30 OUTLAW is sitting in 6th with a 4-8. Class 4 is the nine-boat J/105 class. As usual, it is very close racing with three boats tied on 4 points each for the overall lead. That trio is Chris Phoenix’s JADED with a 3-1, Bucky Rezabek’s RACERS FORMALLY KNOWN AS HERE & NOW with a 1-3, and Erik Kristen’s MORE JUBILEE with a 2-2. The balance of the top five has Tom Kerr’s CORVO in 4th with a 5-4 and Allen Hughes & Shauna Walgren’s CREATIVE with a 4-6 in 5th place. In PHRF 6 class, Don Leighton’s J/35 beautifully refinished TAHLEQUAH is sitting in a comfortable 2nd place with a 2-2. Meanwhile, Stephanie Arnold & Chuck Queen’s J/33 DASH is hanging on to 4th place in PHRF 5 Class with a 3-7. Tolga Cezik’s J/109 LODOS is the top J in PHRF 7 class, sitting in a tie for 4th place with a 4-6. Then, in PHRF 8 class, Andy Mack’s J/122 GRACE is sitting in a tie for 4th with a 3-6, while the Dougherty/ Andrews duo on their J/125 HAMACHI is just behind them with a 5-5. Finally, in PHRF 0 “big boat” class, we find Bill Fox sailing the gorgeous navy blue J/160 JAM into 5th place, giving them a 4-5 tally for the series and tied for 4th place. Not bad for a “cruising/ racing” boat racing against a trio of TP52s, and a custom RP55! 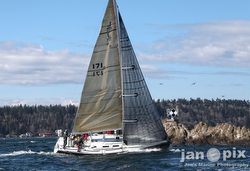 For fabulous photos, check out Jan Anderson’s portfolio here For more Corinthian YC Seattle Center Sound Series sailing information Add to Flipboard Magazine.